For every small edit in your Apple Macbook, no one would want to have to open any softwares like Adobe Photoshop or Gimp or something else that takes time and load to your mac while opening. And the options in these softwares are always complicated. So here is a dashboard(mac users hit F12 to open dashboard) widget which helps you in resizing an image in your mac with no big options and no application linked to open. Its called Image Shackle. When you want to include a picture to facebook or some other similar site and its too large in its dimensions, this widget comes to best use for quick image resizing and decreases the size to your need. – Click and hold on an image from the desktop or finder and then press F12 (or F8 on some iBooks) on the keyboard to reveal your dashboard. Drag and drop the image into Image Shackle. – You can set your own width and height but still, if you don’t want to include your own dimensions, you can drag the image and resize the image. – The image would be saved to the same folder where your original image is, and the name would be recognizable and the size of the image would also be included in the name. – This widget can play with only one image at a time. – If you try to shackle an image from iPhoto, the file will be saved to the folder that the original was in but will not be imported into iPhoto. Instead, export the image from iPhoto at the desired size, or drag the image from iPhoto to the desktop before shackling it. 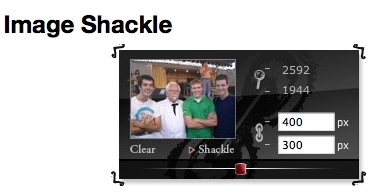 You can download the Image Shackle dashboard widget from here. I found a free online image resizer called QuickResizer Image Resizer. If you are away from your computer and don’t want to download any software, you can just use this online version for free. It’s quick and it’s easy to use. I have just downloaded Image Shackle and tried it a while ago. It’s pretty good. I like it. Thank you for sharing the info! Image Shackle is ok, but it’s just so damn buggy! For some reason it can only handle about 1/3 of the images I try to use it for. Would someone please create a image resize widget that actually works! Plus rotating and mirroring would be nice additions. There are free apps that do this, but no widgets so far.